Last Fall I observed a couple of NATRC rides and decided that they would be a great way for Sunny and I to start our large group riding career - everyone there has a stake in keeping their horses calm and well-behaved, so I figured I'd have a better chance of keeping Sunny calm and well-behaved. Apologies in advance: my memories of the pre-ride activities are *much* clearer than those of the actual ride! And this is a LONG post, so be prepared. To get everyone on the same page, NATRC stands for North American Trail Ride Conference, and, after listening for 2 days, I understand that it is pronounced "Nay-Track". Here is what I think I know about NATRC rides. NATRC puts on competitive trail rides, where horses are judged on conditioning and manners, and riders are judged on their skill in riding, managing and caring for their horses. The judging starts as soon as you check in and includes the set up of your camp. The rides are designed to be ridden in a specified amount of time. You are penalized for each extra minute up to 30 minutes late, then you're disqualified. If you're too fast, you're out. There are three classes of competition: novice, open, and . . . something else. Novice is for beginner horse and rider teams, the others are for more experienced teams. Thus, novice class does less distance than the other classes, and at a lower speed. The default pace for novices seems to be 3.5 mph and 5.0 mph for the other classes. This speed can be adjusted for terrain, so if the ride terrain is unusually difficult, the speed can be lowered. In each class, there are lightweight and heavyweight divisions. "Lightweight" is defined to mean that the rider plus tack weighs over 190 pounds. Heavyweights exceed 190 pounds. Before you start, there's a vet check, where the horses get a once-over: pulse, respiration, gut sounds, back soreness, legs, hydration, etc, as well as a trot out and lunges in both directions, to ensure that they are fit to start with respect to soundness, attitude, etc. In addition, the horsemanship judge makes sure that they are clean and well taken care of and that the handler knows how to manage them in the group. On the trail, there are several Pulse and Respiration checks (P&Rs) as well as observed obstacles, where the judges ask all horse and rider teams to negotiate a specific obstacle and assess their performance. 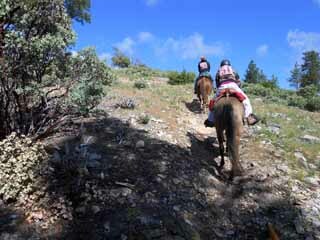 Also while on the trail, teams are judged for things such as one horse crowding another - in other words, manners count! At the end of the ride, the pre-ride vet/horsemanship check is repeated. As you can see, to be successful, you have to have invested the time to have a well-conditioned and sensible horse, hence my interest and confidence that we'd have a good chance of being safe from lunatic horses and riders for our debut. Finally, each time the team is vetted or judged on some horsemanship issue, the judges fill out a little form with comments, which you get at the end of the ride, so you know why they gave you the score that they did. All in all, it looked intimidating and challenging, and something that would be good for Sunny and me both. 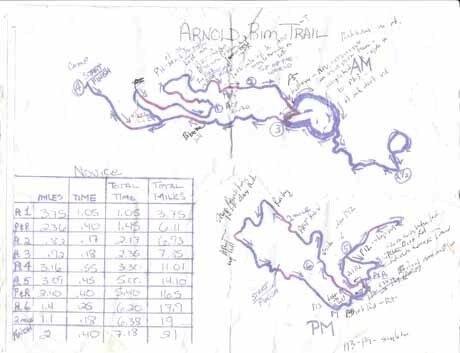 So I signed up for the first ever Arnold Rim Trail NATRC ride. 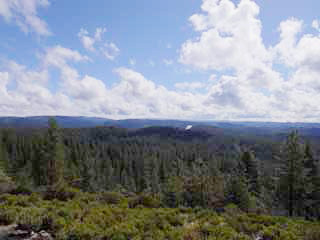 It was held in the National Forest just outside Avery, California - at about 3500 feet of elevation, I'd guess, on Saturday, 22 May. The novice course was 21 miles. That's longer than Sunny had ever done at one stretch before, but we've done a lot of miles and a lot of back-to-back rides, so I figured we could do this. The only little thing is that you have to have your horse "securely" attached to your trailer: portable corrals won't do. And Sunny has developed a pull back problem over the past year, so this requirement worried me a lot, but it also motivated me to do something about it. So I went to Marybeth, as I usually do. This tale was told in a preceding blog (Sunny & Pull Backs) and end of the story was that Sunny successfully spent one night tied to a trailer before we went to the ride. So I figured there was a chance we'd survive, but I was still very concerned. The first hint that this was going to be even more than we had bargained for was the drive in. Google Directions were great until we left the paved road. Then the going got rough - the road had gotten a work out over the really wet and snowy winter, and there was a set of ruts literally 9 inches deep running down the road. They looked like they had been created by a big truck of some kind because they were set at about the width of *my* truck wheels. I was really concerned about getting stuck because the truck is sort of operating at its limits with the camper and the horse trailer both. The task was complicated by the huge puddles that occasionally covered the road. The last 1.5 miles took me almost 45 minutes - I had the truck in 4wd all the way. Sheesh. When I got there, I got some directions as to where to park, unloaded Sunny and went to check-in. I must have telegraphed my nerves: Chris, the Ride Secretary, sent her daughter back to camp with me to show me around and tell me what came next. Thanks, Chris! As soon as I checked in, I had to wear a bib with my number (61) on it any time I was out of the camper, so the judges could identify me, in case I did something really goofy. Also, Chris gave me little ribbons with the number on it to put on Sunny's bridle and halter, in case she got away. There was also a tag for my trailer, so the judges could judge my camp set up. Anyhow, it had gotten really cold as we climbed up to Avery, so I had a heck of a time getting my bib over all my clothes, but I finally did and Sunny and I went for a couple of laps around camp. After that we went over to vet in. The horsemanship judge checked her first by feeling her coat and mane to see dirt, checking hoofs, etc. Then the vet did her exam, while the horsemanship judge watched to see if I was handling Sunny in a way to keep her in control and the vet safe. Sunny stood nicely for the check, then we had to trot out a ways, stop, make two trotting revolutions in either direction, then come back. Sunny was totally confused by lunging on a line shorter than 22' so we didn't cut a good figure, but we were certified as fit to start. The next step was to go to the Ride Meeting - which required that I tie Sunny to the trailer and leave her. I tied her to my trusty inner tube, took a deep breath, pulled up my socks, and marched off to the meeting with my info packet. There were two interesting things about the meeting. The first was the discussion of the map - you can see it above, with my annotations. The top outline is the morning route, the bottom one is the afternoon route. I *get* that a map is a symbolic representation of the terrain, but this was at least one level of abstraction up from a map: as you can see, there were no points of reference, no trail names, no lat/longs, no nothing. As those of you who have traveled with me can attest, I was going to get lost for sure and I was terrified. No one else seemed to be panicking, so I guess that you learn to read these route sheets, just as you do a map. And in addition to the sheet, the route is marked on the trail by ribbons and pie plates. The second item of interest was the weather. First, it rained. Then it hailed. Then it rained. And the wind blew throughout. And Sunny was tied to the trailer. And it was COLD. I was wearing two sweaters, wool socks, and a Carhartt heavy jacket and I was cold. Fortunately, I'd brought Sunny's heavy blanket, so she was okay. Anyhow, I got back to the trailer and Sunny was eating her alfalfa, so I went to bed in the camper. As the rain rattled on the camper roof, I thanked the guys at Scotts Valley RV for fixing my roof and the lights. It was bad enough to be cold, but to be wet, cold, and in the dark would have been too much. Did I mention that it was cold? I didn't want to turn on the heater in the camper because I'd never done it before and trying it in the dark and rain for the first time didn't seem smart. So, I went to bed with my clothes on under two sleeping bags and a throw blanket. Ride management honked a horn at 5:30 AM, so I got up, made myself some coffee and started hand walking Sunny around again until she seemed somewhat comfortable, then I cleaned her, tacked her up and went down to the starting point in time for the 7 AM start. It was clear, for which I was grateful, but cold - I wore a sweater as my first layer, another sweater as my second layer, then my vest and my bib. I felt like the Pillsbury Dough Girl, but I was able to get on Sunny, so I figured it wasn't excessive. Riders start at 30 second intervals, but after the start, usually group up. I *really* needed to group up since I was certain I would get lost alone. Since I didn't know anyone, my plan was to hang out at the start and look pathetic. I got a couple of nibbles, but they didn't work out because I admitted that Sunny was a slow walker - these people had Missouri Foxtrotters, which are gaited horses with really fast walks, so we decided that we wouldn't fit it. Finally, we were running out of people so I just took off. There were two kids (not children, but kids to me!) Daniel and Cacia, right behind us, so we all sort of rode off together. I'll get it out of the way early: if it hadn't been for Michelle (who'll be introduced later), Daniel and Kaysha I would be wandering in the Sierras, even now. I was completely lost within a mile of camp. As I mentioned, the trail was marked with ribbons and pie plates, but I seemed unable to either see them or interpret them. I certainly owe finishing the ride to my companions, so, if you read this, thanks! Our first observed obstacle was about a quarter mile from the start. You had to trot across a little clearing to the judges, then follow their instructions. I think the idea was that the horses would be pretty amped this early in the ride, so this would be a test of the rider's management skills. We trotted over to the judge, who told us to stop, then back 2 steps. Sunny stopped and backed the two steps, but swerved her behind to the right, to see the jeep driving by on the forest road. Dang! When we left that point, Sunny and I were following a man and a woman riding together. I was really working to keep them in sight because I figured that if I had Daniel and Cacia in back of me, and these two in front of me, I had a good chance of (a) not getting lost initially and (b) getting found if I did get lost. Anyhow, in about 15 minutes, the couple separated and the woman slowed down enough for me to catch her. This was Michelle, whom I'd be with for the rest of the ride. Thank you, God. Thank you, Michelle. Anyhow, somewhere in here Daniel and Cacia caught up with us. Or maybe we caught up with them - anyhow, we started riding together. I should mention that, on the infamous map, there was a grid of points on the map and the elapsed time it should take you to get there. So you'd be riding along and there'd be a paper plate attached to a tree with "P3" written on it. You'd refer to the grid on your map, which would tell you that you should be at P3 at 2 hours and 35 minutes into the ride. At the start you're supposed to set your watch or timer to noon (zero), so you have something to match to the time. I thought I'd done that, but I didn't realize how tight the times were going to be: I hit the start button when I got on Sunny, about 5 minutes before I actually started. Michelle had hit the button on time, so she had a clear notion of how we stood. At the first point, we were already several minutes later than the optimum time, so we had to figure out how to speed our little group up. I volunteered to have Sunny take a crack at leading, and she really stepped up. I was wearing my GPS thingie because I wanted to see how her heart rate trended through the ride, but it also gave speed. She was walking between 3.2 and 3.8 mph - which is darned good considering that she wasn't getting to 2 mph early last summer. Anyhow, she seemed to set a pretty good pace, so we stayed in front. Oh yeah, just after we got in front, there were two big boulders across the road. All the horses did the "snort and swoop" when then saw them and it took Sunny probably a minute to get across them and the other horses took their time, even after Sunny was over. These boulders were the ONLY thing that all four horses were leery of in all the time we rode together. Sunny led through overhanging branches and eroded trails. I think we crossed creeks three times in the morning and twice in the afternoon. They weren't the Mighty Mississippi, but they weren't puddles either, and she did great. She'd stop, sniff and go. I was so proud of her. At the first P&R (pulse and respiration) check, she got 8/2 - they measure each item for 15 seconds, so that means a heart rate of 32 beats per minute and a respiration rate of 8 breathes a minute. The people at the stop seemed impressed and a couple of them asked where she came from. Right after the P&R, we climbed to Top of the World. It was steep and rocky, but beautiful at the top. And by far NOT the steepest climb in the ride. In the photo, you can see the clouds coming in. It was cold when we started, but clear. On the trail, it stayed cold because the first part of the ride was down in the trees, and then, when we emerged, the clouds were rolling in and consolidating. Finally, there were large, wet globules falling from the sky. I'm not sure whether it was technically snow or sleet, but it was wet and cold and I hadn't anticipated it on this ride. 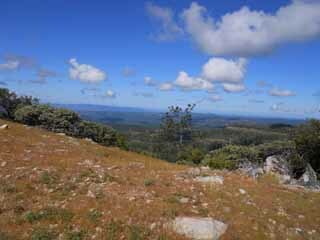 The trails were mostly singletrack with some small sized fire roads thrown in. I was comfortable walking, Sunny seemed comfortable, and, according to my gps unit, we were marching along close to right pace. But by the time we got to lunch, according to Michelle's time keeping we were 30 minutes over time - disqualification territory. I was not too concerned - Sunny was acting like Miss Manners and she'd successfully spent the night at the trailer, so my goals had been met. However, Michelle kept saying, "Your horse is doing beautifully. It would be a shame for her not to place because we missed the time by a minute or two." I thought that was pretty compelling, so we agreed to really step up the pace after lunch. We thought we could do it because we had essentially half the ride left to do - we'd done 11 miles in the morning, so there were 10 left in the afternoon. You have to take 45 minutes for lunch and I thought it would drag, but it was the shortest 45 minutes on record. It seems like I pulled Sunny's tack, got a handful of chips and put on yet another jacket, then realized I had to get her tacked up and back to the Start point in 10 minutes. Sheesh! We made it, but just barely. Just as we came out of lunch, there was another judged obstacle. This one was a series of 3' high berms, all in a row. The idea was to see if you could keep your horse controlled through the quick up and down, and if you could keep your weight in the right places to help your horse stay in balance. I felt like we did okay on that. Anyhow, we stuck to our commitment - we trotted everything that was flat or slightly uphill and had good footing. 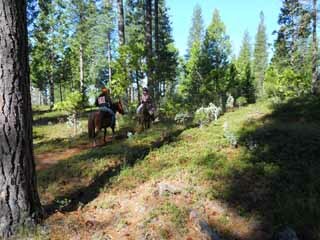 The footing became a consistent issue on the last half of the ride - there were lots of times the trail had either huge boulders in it that the horses would slip on, or babyhead boulders that would roll around under foot. Oh yeah, the last segment before the P & R, we had to ride out to a point, then backtrack back. There was a big tree across the trail and it had fallen so that at the end where it was low so the horses could step over it, there were several large branches to step across. Sunny looked at it, then tried to step across it, but didn't make it - she stuck her foot between two branches. When she tried to step out, it caught her leg and pulled her back. I wasn't expecting it, so when she stopped, I almost went over her head - I wrapped my arms around her neck and saved myself. Sunny stood stock still until I sat up. Then she very deliberately pulled her leg straight up and out and walked on. What a gal. Slight diversion. In the last half there is a point where there are three ultra steep pitches right in a row - much steeper than the climb to Top of the World. The longest is probably only 50 yards, but, to my mountain biker's eye, they look like they are at least 30% grades, and they are erosion paths, so the surface is loose - I wouldn't dream of trying them on my bike, either uphill or downhill. When we were at the bottom, we noticed a woman tailing up the hill ("tailing" is when the rider walks and holds onto the horse's tail, so the horse pulls the rider up the hill, but doesn't have to carry the rider's weight.) I asked Michelle if that was legal because if it was, I wanted to do it, too. The woman answered instead - when her horse was trying to get up the hill, he broke into a canter, missed his footing on the trail, she fell, and as she fell, the saddle rolled under the horse's belly! Somewhere in the wreck, her stirrup was broken, so she couldn't continue the ride, and she was hand-walking him in. Sheesh again. When we left camp after lunch, we were last. By the P&R on the back half we were ahead of 4 other people. At the P&R, we had to do a judged mount. Sunny was practically perfect. 'm not sure where it fell in the ride, but there was another judged obstacle - we had to walk our horses through a big puddle. Sunny had been forging across rivers all stinking day - do you think she'd walk through that puddle? No way! The first effort, she got her toes wet, but danced around to the side. I walked her back through the middle of the puddle and she did very well, so I turned her around to head out and she jumped it! First time ever. Anyway, after the P & R, we continued our pace until I noticed that Sunny was starting to slip in the rear - we'd be walking and she would lose her footing in the rear. That used to happen a lot when I first started riding her, and it happens now when she gets tired, so I told Michelle that I thought Sunny and I weren't going to be able to stick with our trotting program. Michelle took a look around around and said, "The footing's not good enough to trot here anyway. We'll walk too." I think we came to that decision about 3.5 miles from the end of the ride. They were among the longest miles of my life and I'm positive they were THE longest of Sunny's! She slowed down so much that Michelle had to lead. The good news and bad news about Sunny is that she really doesn't seem to care what other horses are doing on the trail. It makes her easy to handle when other horses are misbehaving, but it also means that another horse walking away from her doesn't count as motivation. Fortunately, Michelle is patient and the trails really didn't support speed. The footing was bad and it was all uphill back to camp. We finally made it back to camp and checked in. After that, we had to clean up our horses and get our final vet check. I cleaned Sunny as much as I could while she ate. We went back to the vet, who looked her over and said, "I'd ride this horse, and I don't say that about many horses!" Boy, was I thrilled - I think every one thinks their pony is a genius, but it's really nice to know that someone knowledgeable thinks highly of her, too. Sunny did well on the check, but I blew the trot out by running into a pile of pine needles on the way back. Note to self: look where you're going, stupid! When we were done, I tied Sunny to the trailer again - all she wanted to do was stand still and eat - and went off to watch the rest of the horses vet in. There weren't very many: only 23 teams started and (I think) only 17 finished within the time limit. About 30 minutes after the last horse vetted, the awards ceremony began. And here is the punchline of this whole story: Sunny won best horse in the Novice Lightweight division and I won the Horsemanship award in our division. Whoo Hoo! In the short term, all the credit goes to Michelle. We finished exactly 30 minutes over optimum - if we hadn't moved out when we did, we would have been disqualified. In the longer term, most of what we did was baked in the cake when Sunny was born, so I have Robbie Pruitt to thank for that. And I have Marybeth to thank for enabling me to give Sunny what support she needs. So. We had a great first ride. It was really challenging, but I'm ready to do it again. I'm not sure what I'll do about the map reading, but there's got to be a way to convince Michelle to ride with me again! I didn't mention it specifically, but everyone in camp was friendly and helpful, particularly when they found out that I was a new rider. Linda Thomason, whom I had met last Fall, and Chris, the ride secretary, were both particularly supportive. Figure out a way to spend the night there after the ride. This time I left right after the awards ceremony because it was SO cold and I was worried about Sunny. I would like to have stayed and talked to the judges about how to improve our weak areas, as well as socialize with my new tribe. Sunny didn't drink as much as she usually does. They had nice big water tanks, but she scorned them. I brought her water from home, but she just didn't seem comfortable drinking her usual amount. The only place she seemed relaxed was drinking from the huge puddles. Fortunately there were a lot of them, but that's not going to work come September, for example. Find someone to interpret the judges' comments for me. Practice lunging on a short line in a flat halter. More conditioning - Sunny was tapped out by the end of the ride. I don't know if she could have made it if it had been really hot instead of really cold. Learn to start my timer when I leave the start, not when I get on Sunny.